Born on January 31, 1914 in Merchantville, New Jersey, Arnold Raymond Cream was the son of immigrants from Barbados. He took up boxing at age fourteen after his father died and debuted professionally at age 16 as a lightweight where on September 9, 1930 he defeated Cowboy Wallace in a first round knockout. Walcott ultimately grew into a heavyweight. He was often compared to the great welterweight champion Joe Walcott who was also from Barbados, and he later decided to adopted the name “Jersey” Joe Walcott as a tribute to the older fighter. Walcott fought Joe Louis for the heavyweight title for the first time on December 5, 1947, dropping the champion twice during a bout which resulted in a controversial split decision loss. He lost again in a rematch with Louis on June 25, 1948 in an eleventh round knockout. Walcott fought for the title three more times, before finally capturing the crown on his fifth try by knocking out Ezzard Charles in seven rounds on July 18, 1951. Walcott was 37 at the time, the oldest man ever to win the heavyweight crown up until that time. He retained that distinction until George Foreman won the title in 1994 at age 45. 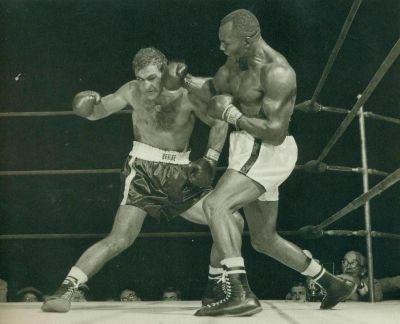 Joe Walcott lost the title to Rocky Marciano on September 23, 1952. After failing to regain it in a rematch eight months later he retired from boxing with a career record of 51 wins, 18 losses, and 2 draws. After his boxing career ended he tried his hand at wrestling, and refereeing boxing matches for a number of years. He was the controversial referee for the Muhammad Ali-Sonny Liston championship bout in 1965. Later Walcott was elected sheriff of Camden County, New Jersey in 1972. He went on to be appointed to serve on both the New Jersey and New York State Athletic Commissions, the latter as chairman. He was inducted into the International Boxing Hall of Fame in 1990. Jersey Joe Walcott died in Camden, New Jersey on February 25, 1994 at the age of 80.